I was all set to have a big shindig of a post for the first weekend of the minor-league baseball season. However, the weather seems to have taken the wind right out of those plans. First, South Bend had its Tuesday exhibition at home canceled along with Friday night’s contest at West Michigan. Tennessee got rained out on Friday night, but they did finish it last night in Mississippi with a doubleheader. The Iowa Cubs did not play Friday night nor are they playing today because of cold and snow. Then again, Iowa played a doubleheader on opening day. And Myrtle Beach was rained out last night. As a result, it was as weird an opening week I can remember. 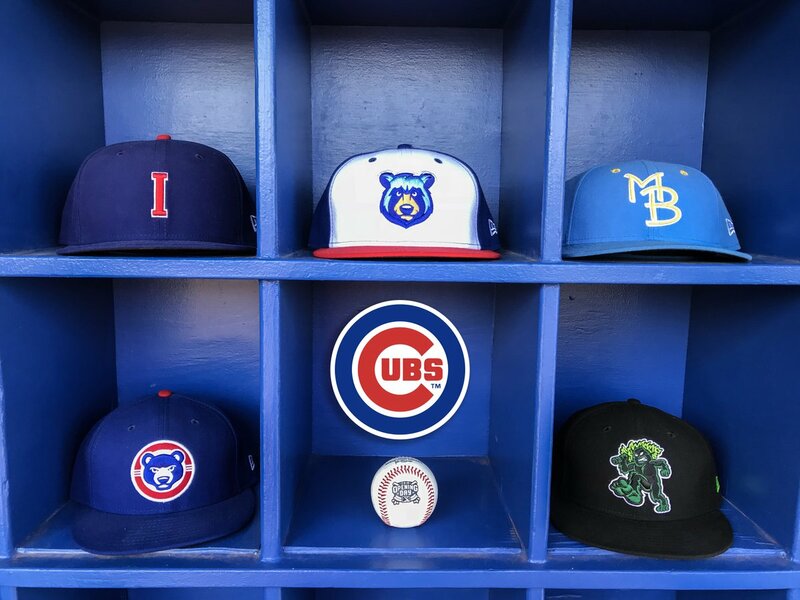 On opening day on Thursday, all four affiliates got games in. Iowa split a doubleheader with Oklahoma City while Tennessee lost to Mississippi. Myrtle Beach lost to Frederick, and South Bend rounded out with their loss to West Michigan. Going 1-4 on opening day is not conducive to having good feelings. There were a couple of common themes to play across all levels on opening day. There were a lot of defensive miscues and errors and a lot of baserunners that were left stranded. It was tough to watch at times. Add in fly balls that landed in between several players or a grounder that two players just watched go between them because they each thought the other would get it. Nobody got an error but the pitcher gets charged with an earned run. Those are mental errors that need to get worked out quickly. I am willing to chalk it up to first night jitters and just working the kinks out. Saturday night was a different story. All three affiliates played in frigid weather. Temps at game time ranged from the low 30s in Iowa and South Bend to 41 in Pearl, Mississippi for the Smokies’ double bill. The first game I watched was South Bend. Pitchers Javier Assad, Rollie Lacy and Manuel Rodriguez looked great in shutting out West Michigan. Lacy had hitters flailing at changeups and curves as he struck out 7 in 3 IP. In Tennessee, the Smokies won the suspended game from Friday behind 4 innings of no run ball from Zach Hedges and Trent Giambrone’s 2 for 3 with 2 RBI game. The Smokies lost the nightcap, a 7 inning affair, 7-5. Thomas Hatch gave up 3 runs in his 4 innings on 77 pitches but struck out 6. When he left, the Smokies were up 4-3. For the day, Trent Giambrone had 4 RBI for Tennessee. Iowa also got a great start from Luke Farrell who threw 5 and 2/3 scoreless and struck out 6. However, after a night of scoreless ball, each team scored 3 runs in the tenth thanks in part to the new extra inning rules. Oklahoma City won it 6-5 after scoring 3 more runs in the 11th. While the new rule of starting the tenth with a runner on second did make it exciting, it also came across as a bit ridiculous especially since it didn’t help end the game any sooner. The Annual Preview of a Preview for Eugene comes out on Monday and that’s all I have planned for the week. I am going to let the baseball do most of the talking every day. It will be nice to write about what does happen rather than what could/should happen. Originally, I had planned on doing selecting a hitter, starting pitcher, reliever, and team of the week. Due to all the inclement weather, that’s not gonna happen. Rather, here is who got the players of the day on Thursday Friday and Saturday this week. 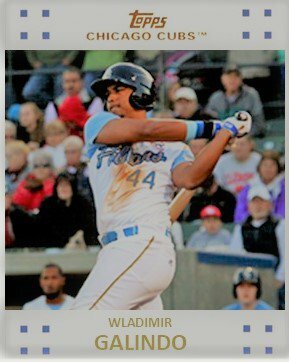 And the first “Card of the Week” in the minor-league season goes to none other than Larry Kave of the Myrtle Beach Pelicans for his shot of Wladimir Galindo that I put into a 2007 frame. This morning, I will be uploading several cards using a variety of templates. Check the April Facebook album later today and throughout the week.